Are you ready to play in the New 28 and older NWIBL Clackamas Division? Play one to two games a week on Monday, Tuesday, Friday Nights and maybe a few games on a Saturday? Do you still have the passion for playing baseball but you want to play in a competitive league with ball players who have been playing competitive baseball (Minimum High School Team Experience Needed)? Then get your glove and come tryout for our Clackamas 30+ division. The Clackamas division is still wood bat and plays all their games in local stadiums you'll play a few of the Willamette teams just to keep you sharp. Sign up now so you can continue to play baseball this Summer in the Northwest Independent Baseball League. Space is limited only 15 players per team. Need 4 teams to start. Wood bats, helmets, and catchers gear supplied to each new team. Friend number 300 wins a Brett Gabon Bat! Charles B. Walker Stadium, Lents Park, is located at the S.E. 92nd and Holgate. Volcanoes Stadium Directions Keizer Station Blvd. NWIBL Teams Play at the Salem-Keizer Volcanoes Stadium again in 2015. The summer drive to Volcanoes Stadium is so easy. From Portland, jump on I-5 south, enjoy the sun and cruse for about 50 minutes and there you are: great baseball, wonderful shopping within walking distance, and yes PGE sports fans, actual on site parking at the stadium. You get everything from the Volcanoes baseball stadium and NWIBL baseball experience: an extremely affordable, family-friendly environment, easy to reach location, and a history of consistent WINNING baseball. We all appreciate that the economy has its challenges here in Oregon, which is all the reason to come to Sckavone and Walker Stadiums to watch baseball as admission is still free. Games played at Volcanoes Stadium charge fraction of the price it would be to see the Mariners, Seahawks or Blazers play, you get a close up, unfiltered look into the life of semi-professional baseball, plus true community-centric promotions, great food and beverages, in a relaxed and welcoming atmosphere. It's almost Baseball Season...you hear about baseball on the radio, you read about it in the newspaper, you see it on TV, now you can play it in a local Portland Stadium. Come join us, you can play this fall for local Portland baseball teams. Season starts in May, play 20 plus games with elimination champion series. Embassy Suites PDX in January 2015. With the advent of the Portland Beavers leaving Portland at the end of the 2010 season everyone is asking what will happen to baseball in Portland next season (2015). The Northwest Independent Baseball League has the answer. The 2015 seasons looks for the league to expand with up to 3 new teams (Portland Cubs, the Stumptown Brewers, and Oregon City Mavericks). Players within the three divisions can continue their passion playing base ball at the highest level. Players follow modified MLB rules and use umpires form Portland based umpire associations. Come see Semi-professional baseball played with local teams and players form the Portland's and Vancouver area. 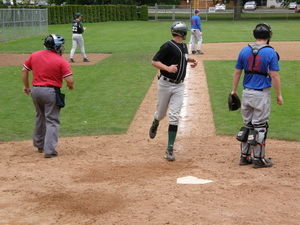 Fourteen teams play baseball from May through August at Walker and Sckavone Stadiums (see schedule at NWIBL.ORG) in Southeast Portland. Teams consist of players with High School, College, and Professional experience and are looking for local sponsorship. Come see teams this year (2012) as they battle it out for the city championship to be held with a double elimination series the last 2 weeks in August. Thanks to the City of Portland Parks division the stadiums are kept in game ready play all summer and into early fall. Fans are welcome to attend any time they wish at no charge just visit NWIBL.ORG for games and times at each venue. The league also supports Monday Night Baseball at Sckavone Stadium open to anyone over 18 who wants to experience playing in a stadium every Monday. Gates open at 5.30 PM and lasts till dusk. Teams from with in 100 miles welcome to join. So if you are a former or current player who has what it takes to compete, EMAIL US NOW. We are gearing up for this season! Catchers, LH Pitchers, and LH Hitters welcome! Tryout now! Do you miss the crack of a baseball rocketing off a WOOD BAT? Do you miss puttin' on metal spikes and gettin' dirty diving for that "web gem" play? Miss the thrill of blowing a fastball by a hitter? Getting mobbed by your team for that walk off hit that drives in the winning run? We play hard and we play to win but most importantly we have fun. We are gearing up for the 2015 summer season! We need Pitchers, catchers and players who can play any position, You have to believe your the best and play like you think.....Players who want to win, Players who put sportsmanship on and off the field fist. Players who will give back to the Portland Community. We are gearing up for the 2015 Fall season! We need Pitchers, catchers and players who can play any position, You have to believe your the best and play like you think.....Players who want to win, Players who put sportsmanship on and off the field fist. Players who will give back to the Portland Community. We are gearing up for the 2015 season! We need Pitchers, catchers and players who can play any position, You have to believe your the best and play like you think.....Players who want to win, Players who put sportsmanship on and off the field fist. Players who will give back to the Portland Community. If you live in any of these cities call about being placed on a team. If you played Baseball in Australia, England, Canada, Netherlands, Dominican Republic, Panama, Latin America, Cuba, Costa Rica, Puerto Rico, Venezuela, South Africa, England, China, Japan, Mexico, Taiwan, Korea an want to play register here to play baseball .